Paperback, 184 pages, 13.5 x 21.0 cm, 5.3 x 8.3 in. No! – That's what millions of voices yell everyday when children and teenagers are prompted to stick to proposed rules. However, the conflict that follows the “No!” reveals whether those rules are really valid and effective or not. If “nerve-racking children put our nerves on the rack”, we must defend the rules consistently but also with a sense of respect and appreciation. 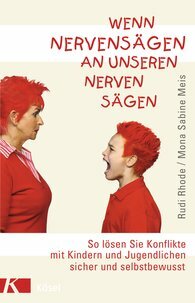 Providing many useful tips, Rudi Rhode and Mona Meis show how parents, educators, teachers and social therapists can assert themselves securely and confidently in conflicts over rules. The inner attitude is significant as well as one's supportive outward body language. And the ability to argue constructively is the best basis for successful conflict management. - The author duo is very active on the seminar and lecture circuit.